(22697.17, George Forsyth Collection, OHS). Located in central Oklahoma, Oklahoma County is bordered by Logan County on the north, Lincoln and Pottawatomie counties on the east, Cleveland County on the south, and Canadian County on the west. Formed from the Unassigned Lands and designated as County Two in 1890, Oklahoma County is drained by the Deep Fork and the North Canadian rivers. Named for Oklahoma City, the county is comprised of 718.31 square miles of land and water and is located in the Red Bed Plains physiographic region. The incorporated towns included Arcadia, Bethany, Choctaw, Del City, Edmond, Forest Park, Harrah, Jones, Lake Aluma, Luther, Midwest City, Nichols Hills, Nicoma Park, Smith Village, Spencer, Valley Brook, The Village, Warr Acres, Woodlawn Park, and Oklahoma City, the county seat and state capital. According to a 1981 Oklahoma archaeological survey Oklahoma County had 102 known archaeological sites. Sixty sites have been identified to time period. Two represent the Paleo era (prior to 6000 B.C. ), twenty-five the Archaic era (6000 B.C. to A.D. 1), fourteen the Woodland era (A.D. 1 to 1000), and nineteen the Plains Village era (A.D. 1000 to 1500). Five sites are listed in the National Register of Historic Places: the Booher Site (NR 79003641), the Nagle Site (NR 79002011), the Point 8 Site (NR 78002250), the Quillin Site (NR 79002005), and the Spencer Number 2 Site (NR 78002252). The state of Oklahoma originally lay within the area known as the Louisiana Purchase, which the United States acquired from France in 1803. After the purchase explorers, traders, and others traversed the region. Frontier trader Thomas James reached the North Canadian River near present Oklahoma City in spring 1823. In 1832 traveler and author Washington Irving traveled west from Fort Gibson and came through future Oklahoma County on his return trip to the fort. He recorded his visit in A Tour on the Prairies (1835). Trader Josiah Gregg passed through the area in 1839 when attempting to establish trade between Missouri and Santa Fe, New Mexico. In 1825 the Osage ceded the area north of the Canadian River. Part of this area was selected for the Creek and Seminole, who were removed from southeastern United States in the 1820s and 1830s. Following the Civil War (1861–65) the Creek and Seminole ceded their land as enforced by the Reconstruction Treaties of 1866. Vacated tribal lands became known as the Unassigned Lands, which were opened to non-Indian settlers in the Land Run of 1889. Around 1858 Jesse Chisholm was operating a trading post at Council Grove, which was located west of present Oklahoma City. Seven years later Confederate Indian agent for the Creeks Israel G. Vore invited American Indians to meet at Council Grove and to surrender as the Civil War ended. Threats from Union forces to disperse the meeting caused delegates to meet at Camp Napoleon on May 24, 1865, to adopt a peace compact. Following the war William McClure established the 7C Ranch near present Choctaw. Montford T. Johnson operated a ranch at Council Grove in the 1870s and 1880s. In 1879 Oklahoma boomer David L. Payne learned about the Unassigned Lands and led a group of settlers from Wichita, Kansas, to the south bank of the North Canadian River in spring 1880. Near present Oklahoma City Payne and his followers laid out a town called Ewing, probably named in honor of Union Gen. Thomas Ewing. The settlement was short lived. Payne and his party were arrested and eventually escorted back to Kansas. Prior to the 1889 land opening the Southern Kansas Railway (later the Atchison, Topeka and Santa Fe Railway, AT&SF) constructed a line from the Kansas-Oklahoma border through present Oklahoma County. At the North Canadian River a watering stop for steam engines, known as Oklahoma Station, was established in February 1887. A post office was established at Oklahoma Station on December 30, 1887. The post office name changed to Oklahoma on December 18, 1888, and to Oklahoma City on July 1, 1923. Approximately fifty thousand settlers participated in the opening of the Unassigned Lands. Many claimed land near the established railroad stations. Thus, Oklahoma City became a town of an estimated four to six thousand on the afternoon of April 22, 1889. With the passage of the Organic Act of 1890 seven counties were established. Oklahoma County was originally known as County Two, with Oklahoma City designated as the county seat. In 1890 Oklahoma County had 11,742 residents. 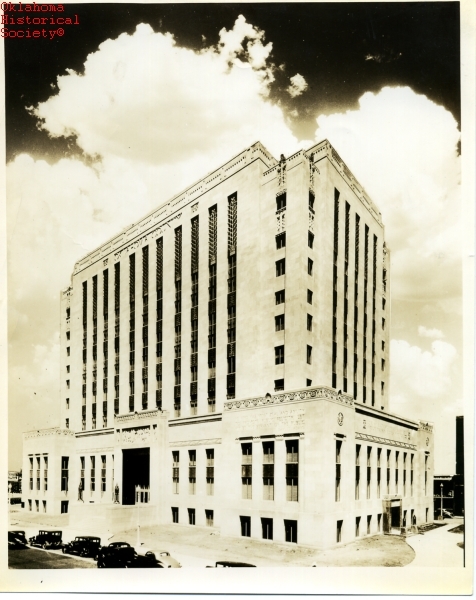 Initially the county commissioners rented space until a courthouse was constructed in 1904–05 at 520 West Main Street, Oklahoma City. Architects Berling, Hoff, and Wells designed that sandstone structure, which featured Victorian Romanesque design with turrets, arches, and pitched gables. The Gross Construction Company erected the building at a cost of approximately $100,000. Solomon A. Layton and John Forsyth designed the second courthouse (NR 92000126) situated at 321 Park Avenue. With funding from the Public Works Administration, the Manhattan Construction Company completed the thirteen-story, Art Deco-style edifice in 1936–37. Guthrie, in Logan County, served as the territorial capital as well as the state capital until June 11, 1910. On that date a majority of the voters selected Oklahoma City as the state capital. Because woman's suffrage had not yet passed, 135,944 men cast votes, with 96,261 for Oklahoma City, 31,301 for Guthrie, and 8,382 for Shawnee. On June 12, 1910, Gov. Charles N. Haskell wrote a proclamation on Lee-Huckins Hotel stationery declaring Oklahoma City as the state capital. State government operated from the Lee-Huckins Hotel and rented office space until the Oklahoma State Capitol (NR 76001572) was completed on June 30, 1917. In early years the county's economy was primarily based on agriculture. Principal crops were cotton, wheat, corn, oats, Kaffir corn, potatoes, alfalfa, hay, and sorghum. Around 1908 Oklahoma County had 160,000 acres under cultivation. In the 1920s Nicoma Park, situated east of Oklahoma City, developed as a poultry colony. In 1930 livestock numbered 13,225 mules, 13,225 cattle, 3,627 horses, 2,669 hogs, and 655 sheep and goats. By 1935 the county had 4,001 farms comprised of 380,286 acres. Of those farms, 52.86 percent were operated by tenants. In 1963 Oklahoma County farmers had 22,800 acres planted in wheat, 13,700 acres in oats, 9,400 in hay, 4,900 in barley, and 4,700 in sorghums. That year livestock numbered 150,000 chickens, 30,000 cattle, 4,900 hogs, 4,400 sheep, and 3,200 milk cows. At the turn of the twenty-first century Oklahoma County had 996 farms comprised of 160,498 acres. Gradually the county's economy evolved to include oil and gas development, manufacturing, and transportation. In 1908 Oklahoma County had four brick plants, three flour mills, two cotton oil mills, a cotton compress, and a meat packing plant. In the 1930s cotton gins continued to operate in Choctaw, Edmond, Harrah, Luther, and Oklahoma City, and the Ford Motor Company was producing automobiles in an Oklahoma City plant. Jay Cola (Jay-Kola) Bottling Works was among ten Oklahoma City bottlers. The capital city also boasted five broom manufacturers, seven brick plants, three garment factories, a furniture manufacturing company, and eight mattress manufacturers. As the largest metropolis in Oklahoma County, Oklahoma City and its suburban areas became the dominant location for industry. With the advent of World War II and through the efforts of civic leaders an aircraft plant known as the Midwest City Douglas Aircraft Company Plant was under production in 1943. The plant was closed in 1945 and transferred to the Oklahoma City Air Technical Service Command (OCATSC) at Tinker Air Force Base. In addition to TAFB the General Motors Assembly Plant was a large employer in Oklahoma County. The plant existed in southeast Oklahoma City and produced passenger cars and sport utility vehicles from 1979 until its closing in spring 2006. Sometime between 1917 and 1919 geologists George D. Morgan and Jerry B. Newby initially determined that there were favorable indications of oil and gas around Oklahoma City. However, the petroleum industry in Oklahoma County did not become prosperous until the Oklahoma City Discovery Well (NR 77001095), situated southeast of the Oklahoma City limits, was completed by the Indian Territory Illuminating Oil Company and the Foster Petroleum Company on December 4, 1928. By the 1930s hundreds of wells had been drilled in the Oklahoma City Field. Many gushers and blowouts occurred, including the Sudik Number One, better known as the "Wild Mary Sudik." In the 1930s Oklahoma City had twelve oil refineries and approximately fifty oil companies. At least fifty-eight machine and oil field tool shops, including the J. B. Klein Iron and Foundry Company, supported the petroleum and other industries. The Oklahoma City Field expanded until 1935, after which it declined in production. Between the 1890s and the early twentieth century Oklahoma City became a transportation hub with the development of railroads and the interurban. The first railroad through present Oklahoma County was the Southern Kansas Railway (later AT&SF), constructed from the Kansas-Oklahoma border to Purcell in Indian Territory in 1887. Other railroads soon followed, making Oklahoma City a transportation hub in the early twentieth century. At the turn of the twenty-first century the Burlington Northern-Santa Fe, the Union Pacific, and the Stillwater Central served Oklahoma County. Between the early 1900s and the mid-1940s the interurban connected Oklahoma City with Edmond and Guthrie to the north, Moore and Norman to the south, and Yukon and El Reno to the west. With the advent of the automobile the better roads movement evolved in the 1910s and 1920s. Modern motorists use State Highways 3, 66 (former Route 66), 74, and 270. A portion of U.S. Highway 77 connects Oklahoma City and Edmond. U.S. Highway 62 runs east from Oklahoma City through Nicoma Park, Choctaw, and Harrah. At the turn of the twenty-first century the main transportation routes were Interstate 35, which traverses Oklahoma County north to south, and Interstate 40, which crosses the county east and west. Interstate 240, in the southern part of Oklahoma County, runs east and west and connects Interstate 44 (north and south route) to Interstate 40 in the eastern part of the county. A short stretch of Interstate 235 allows traffic from Interstate 35 to flow on to U.S. Highway 77, which connects Oklahoma City and Edmond. Air transportation developed in the 1920s. Prior to 1920 aviators in Oklahoma used farmland or any flat area to land their aircraft. In 1920 the short-lived County Line Airfield was built in south Oklahoma City along the Oklahoma-Cleveland county line. Four years later the Southwest Aviation Park opened at Southwest Twenty-ninth Street and May Avenue in Oklahoma City. In 1928 the Curtiss-Wright Company constructed a hangar near Britton Road and May Avenue, Oklahoma City. Beginning in 1934 aviator Wiley Post utilized that hangar when he designed and modified his planes. During World War II the U.S. Army Air Corps utilized the Oklahoma City Municipal Airport and renamed it Will Rogers Air Field. On March 27, 1946, the U.S. Army returned the operation of that airfield back to Oklahoma City. At the turn of the twenty-first century the Will Rogers World Airport in southwest Oklahoma City remained the busiest airport in the state, serving more than three million passengers in 2004. The Wiley Post Airport (originally known as Tulakes Airport), located in Bethany, served business and corporate air travelers, thus relieving traffic at Will Rogers. As in other frontier areas, in Oklahoma early settlers quickly established subscription schools until public schools could be funded through taxes. By 1908 Oklahoma County had approximately six hundred schools. In 1908 two business colleges and the Oklahoma College for Young Ladies were situated in Oklahoma City. The Booker T. Washington High School in Luther and Douglas High School in Oklahoma City were among the facilities educating African Americans during the first half of the twentieth century. Numerous private and public colleges opened in Oklahoma County. Beginning in 1891 residents could receive a higher education when the Territorial Normal School (now University of Central Oklahoma) opened in Edmond. Epworth University (predecessor of Oklahoma City University) held its first class in 1904. Since 1909 the Nazarenes have had a college (now Southern Nazarene University) located in Bethany. The Southwestern Christian University is also situated in Bethany. The Oklahoma Christian University of Science and Arts has operated in Oklahoma City since 1958. Rose State University in Midwest City offered its first class in fall 1970. The Oklahoma State University–Oklahoma City branch was founded in 1961, and the Oklahoma City Community College opened in 1972. At 1907 statehood Oklahoma County had 55,849 residents. Population has continued to increase each decade. The 1910 and 1920 censuses reported 85,232 and 116,307 inhabitants. Following the discovery of oil and gas the numbers jumped to 221,738 in 1930. Pre– and post–World War II Oklahoma County had populations of 244,159 325,352, and 439,506 in 1940, 1950, and 1960, respectively. In 1970 the population exceeded one-half million. In 1980 and 1990 the numbers stood at 568,933 and 599,611, respectively. At the turn of the twenty-first century the county had 660,448 residents. In 2010 the number had grown to 718,633, of whom 64.6 percent were white, 15.4 percent African American, 3.5 percent American Indian, and 3.0 percent Asian. Hispanic ethnicity was identified as 15.1 percent, having almost doubled from the census year 2000. In the year 2010 Oklahoma County had 126 National Register of Historic Places listings. Among those were numerous historic neighborhood districts in Oklahoma City including Carey Place Historic District (NR 98001224), Edwards Historic District (NR 96001028), Edgemere Park Historic District (NR 80003283), Jefferson Park Historic District (NR 95001466), Mesta Park (NR 83002102), and Paseo Neighborhood Historic District (NR 04000517). Representative of industrial buildings and districts are the Stanford Furniture Company Building (NR 83002109), Farmers' Public Market (NR 82001497), Kaiser's Ice Cream Parlour (NR 78002246), and Stockyards City Historic District (NR 79003643) in Oklahoma City, the Threatt Filling Station (NR 95000038) in Luther, Tuton's Drugstore (NR 80003278) in Arcadia, and Citizens State Bank (NR 80003279) in Edmond. Outdoor enthusiasts enjoy Oklahoma County's Lakes Overholser, Draper, Hefner, and Arcadia. The Oklahoma City Fairgrounds is the venue for events such as the State Fair of Oklahoma, car racing, and antique and craft shows. Bob L. Blackburn, Heart of the Promised Land, Oklahoma County: An Illustrated History (Woodland Hills, Calif.: Windsor Publications, Inc., 1982). Bob L. Blackburn, The Physical Legacy: Buildings of Oklahoma County, 1889 to 1931 (N.p. : Southwestern Heritage Press, 1980). "Oklahoma County," Vertical File, Research Division, Oklahoma Historical Society, Oklahoma City. Linda D. Wilson, "Oklahoma County," The Encyclopedia of Oklahoma History and Culture, https://www.okhistory.org/publications/enc/entry.php?entry=OK039.